Nope - theory11 does not release quantity information about our decks. Is there a picture of those somewhere? I've never seen them. 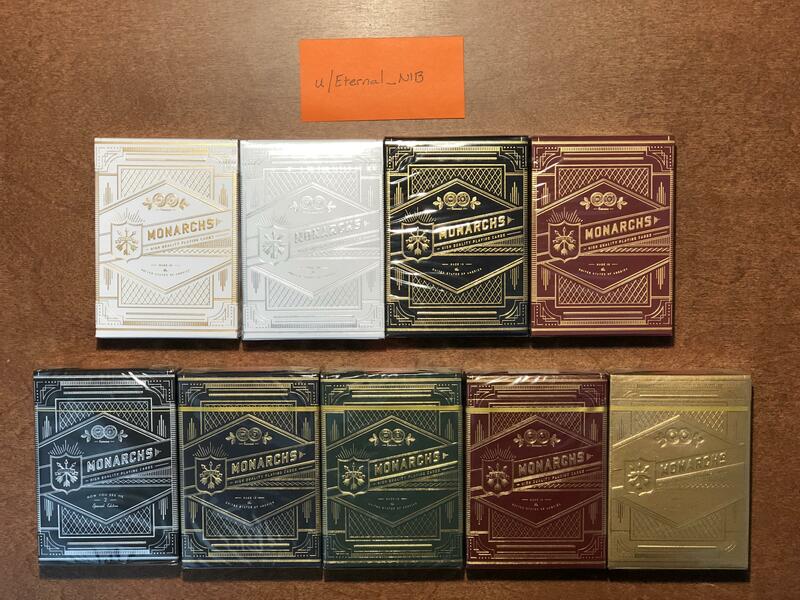 While Theory11 does not release quantity information about decks, the Monarch Gold release (gold on black cards) is limited. Could someone refer me to a thread that discusses its release and how soon it sold out, and while not nearly as rare as the 144 deck gold on blue version, they look attractive, even though they sell second-hand for more than $70.00 per deck. I know, NYSM version, Im not talking about that one, Bruh. In talking about next to the silver and the next to the nysm. The owner also say "The top row has the old T11 logo on the bottom of the tuck and the bottom row has the new logo. " Only the NYSM2 version is black (unless you count the cards inside the Gold Monarch deck). The photo does not give enough info to tell what that deck is for sure. It will be a Pre-release Monarch or one of the Monarch Blue variants. Changing of the logo on the bottom flap does not constitute a major variation. We have made lots of small changes to the Monarchs over the years, too many to list. Changing the logo is the least of those changes. a REALLY avid collector might try to get all variations, however we do not list minor variants anywhere. Thank you so much, Lyle! So let me make sure I have this right, the Blues are the original design? Are there any major variants like the Red V1/V2? Wouldn't matter which ones I put in the collection I have then? Red Monarchs are all considered one product, but there are two major variants, each identified by their tuck case color and texture. The old one is almost a pink paper, and is soft. The newer one (with many, many more decks in this variant) is deep red and smooth. Whether you need both in your collection is us to you, but hunting for some of the little variants is not going to be easy. Sorry I misworded my post above, are there any major variants of the blues? Not major. Multiple minor variations. Awesome thanks for the info. I was wondering if the 4 pack of blue monarchs are still around? They seem almost impossible to find, although not nearly as hard as the Eleven Madison Parks. In the next few weeks I should have majority of the major variations of Monarchs. Awesome thanks for the info. I was wondering if the 4 pack of blue monarchs are still around? These were around for years, but have since been discontinued. Should be relatively easy to find on eBay and the like. Yea, these were NEVER sold by theory11, and only available to diners at EMP for a limited time as a part of one of their specific menus. That menu changes over time, and won't likely ever be repeated. I have every single significant Monarch variant that exists, EXCEPT for the EMP Monarch and other private variants (mentioned below). Most people could count a Monarch collection as complete without this, since it was never released. If your collection is not complete without EVERY Monarch variant, then no living person has or ever will have a complete collection - there are special Monarch variants printed for private entities that you will never see or hear of. Eleven Madison Park Monarchs would have been one of these, but with EMP as one of the top rated restaurants on the planet everything they do gets a little extra attention. With that the card collecting community eventually figured out that they were a thing and now everyone knows about them. The others private variants? Odds are they will never see the light of day. I have never been approached by someone who has seen or even heard of one. These are as good as gone forever, unless you have big $$$. 144 of them exist, and I am sure that by now a good number have been destroyed or lost. Because you can't tell if they are authentic or not without opening them, the market is flooded with fake listings. You would be lucky to ever find a bonafide authenticated OPEN deck, let alone a sealed one. You would think theyre not that hard to find but the only one I have found online has "No Big Tuck Case Included" in lettering you can barely read against the ad. As far as my collection goes, here in the next week or two whenever a shipment of decks I ordered from New Zealand gets here I will have my collection just about complete. Only thing missing is the V1 white/gold and the EMPs so I will be happy but will continue looking for those two variants. I see the V1s on ebay a lot, just need to put some cash together for them. There is, but you won't find it easily. There was supposed to be a different "Original" Monarch deck that had a dark blue background and gold design (instead of white design). These were printed, and 1 gross of them (144 decks) made it into the wild. We didn't think they looked the way we had invisioned, so that print run was shredded and we started over. What we ended up with next was the current "Original" Monarch deck. That is the first Monarch deck we sold in significant quantities. You say "yet" like you can get them somehow. Where would I be able to get one?